Saturn is named after the Roman God named Saturnus. In the Roman mythology, Saturn is the god of agriculture. Saturn is the sixth planet from the sun. The distance from the sun is 890.7 million miles away. It is 745,645,000 miles away from Earth. The rotation time of Saturn is 10 hours 39 minutes. That means a day on Saturn is less than 11 Earth hours. Saturn's revolution time is 29.45 Earth years so a year on Saturn is almost 30 times as long as a year on Earth. 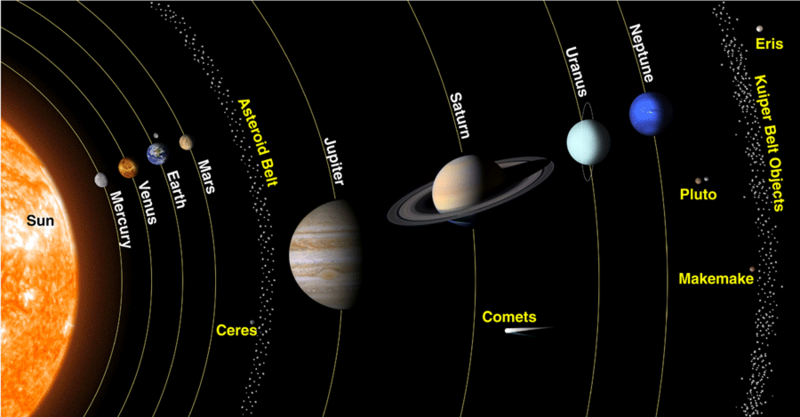 The diameter of the planet is 74,898 miles. Its polar diameter is 67,560 miles. It is about 9.4 times the diameter of Earth. It’s mass is 5.68e26 kg. The actual gravity pulling at any spot on the surface is only 91% of Earth's gravity. An object that weighs 100 pounds on Earth would weigh 107 pounds on Saturn. Saturn is a gas giant planet. It has a rocky core. The rocky core has a radius about three times the radius of Earth. Above the core there is a liquid hydrogen metallic layer. Above that layer there is a molecular hydrogen layer. Saturn has a thin atmosphere. The planet’s atmosphere is made up of 97 % hydrogen and 3% helium. Saturn has extremely high velocity winds on its atmosphere. The wind speed on Saturn is measured as high as 188 miles/hr.